Today: The third and final part of the trilogy attempting to compare and contrast Hibs’ lauded team of the 1970s’ with a selection of all-stars from the decades since. The respective managers take a hand too – one that is more than a little influential! Jimmy is many people’s favourite Hibee and it’s not hard to fathom why. There was a certain spell when he couldn’t seem to stop scoring hat-tricks though a certain Edward Turnbull at times seemed blind to these deeds. 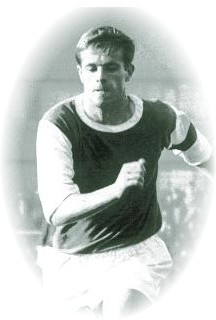 Jimmy O’Rourke was a predatory natural scorer and with him buzzing around up front…well anything was likely to happen. Stevie Archibald came along to a few fanfares direct from Barcelona and was maybe one of the most outright classy players I’ve witnessed in the green and white. Slightly imperious and dismissive of attitude at times, one had to accept this of ‘Archiegoals’ has he was a player who knew his own worth! 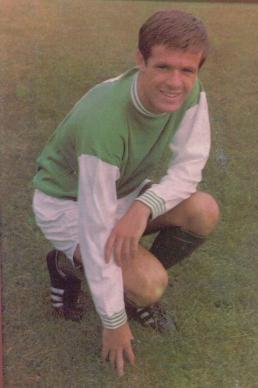 He came along in an interesting time at Hibs when a few headline-making signings were being committed to the Hibs cause. It didn’t last but it was a heck of a good watch while it lasted. Alan Gordon was an intelligent footballer as his manager famously noted and was also a pleasure to watch the way he fulfilled his striker’s role. Like so many players under the spotlight here, it was difficult to hurry Gordon in to a move he didn’t want to make. His play was based around the way he wanted to play and let go the kind of shot or pass that he determined was the right one at the right time. At times it appeared somewhat languid. Alan Gordon was certainly one of those players who had the uncanny ability to be able to ‘hang’ in the air when rising for a header in the box. Of course we all know that this ability is all about split-second timing and it’s perhaps this that gave the Tornadoes striker such a feared reputation as an aerial threat. Continuing with the quest to compare the great Turnbull’s Tornadoes team with an XI selected from players gracing the green and white of Hibernian FC since those halcyon days. Today I look at the midfield contenders with some classic match-ups and confrontations derived from the last four decades. Another complete contrast in styles but operating in the same area of the field. Alex Edwards was all about creativity and displayed a near-genius for spraying the ball around to his teammates all over the field. Sometimes accentuated and occasionally hindered by his naturally abrasive character, opponents would often key on this strength/weakness in Alex’s game. With a man like Alex around though something was always happening – usually another penetrating attack set off by one of his sublime passes. I’ve gone back almost to Tornadoes days to delve and find a worthy competitor in this area of the team and it’s the superb Des Bremer who has been pulled out of the hat. 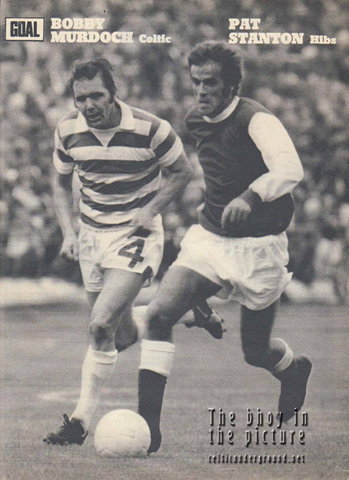 Perhaps Des’ greatest moments were with Aston Villa in winning the League and the European Cup but he was a great and consistent performer at Easter Road. Des’ trademarks were his surging, driving runs down the right wing and his tireless tracking back and work ethic on behalf of the team. Perhaps one of those types of players who tends to be a little overlooked by more showy performers, it’s no surprise to me that Aston Villa manager, Ron Saunders saw him as the man to tend his great Villa team’s right flank through their successful years. You knew what you got with Des Bremner. What’s more you’d get it every week too. I recently set my mind to the question as to who are the ten greatest Hibs players of all time. What a difficult job that is over 130 years-plus of history but here are the selections I came up with. In fairness to those great players that played in an era before mine, I’ve picked one or two on repute and and based those choices on reading, research and repute. My personal Hibs Hero. Along with Lawrie a toss-up for the best Hibs striker of them all. Joe was world-class, make no mistake. Lightening-fast, a cannonball shot with both feet and a superb header of the ball in spite of his modest height. A feisty attitude on the pitch also made this man the complete centre-forward. A great man off the pitch to boot.